You must Register or Login in order to Apply. Chief Officers and Municipal Manager Vacancies!!! 1. First complete your profile or Register as guided. 2. 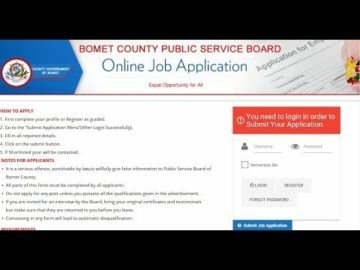 Go to the “Submit Application Menu”(After Login Successfully). 3. Fill in all required details. 5. If Shortlisted your will be contacted. It is a serious offence, punishable by law,to willfully give false information to Public Service Board of Bomet County. All parts of this form must be completed by all applicants. Do not apply for any post unless you possess all the qualifications given in the advertisement. but make sure that they are returned to you before you leave.